Colorado Rubber: What is your favorite hockey memory growing up? Landon Smith: When I was really young, my family would go up to Keystone Lake. I was skating before I could walk. Waking up at 5 a.m. and going to skate on the lake, it was fantastic. CR: What is your favorite memory in the game since leaving Colorado? LS: There’s been so many for so many different reasons. I really enjoyed playing in a different country in Salmon Arm, British Columbia (for junior hockey) – hands down one of the nicest places I’ve ever lived. The people were very genuine the hockey was very pure. Going to the Frozen Four last year was an unforgettable experience, too. LS: It definitely starts with my dad (Thompson) on the ice. When I was a young kid, he ran a camp for me and my buddies called Mallards Hockey Club. That’s when I learned to love hockey and that’s what sustained me through all these years. Off the ice, my family and friends. I have a great core group in Colorado and elsewhere. I know I have about 100 people I could call if I need encouragement. CR: Did your parents have any background in the game? LS: My dad just fell in love with the game. When I was born, he bought me a pair of skates and hung them above my crib. And I don’t know anyone as competitive as my mom (who has played in various leagues for years). She’s a firecracker and she loves the game. We’ll be in the driveway and shoot pucks and she’ll ask me question after question. LS: I hope to have my own hockey camp this summer because a big part of hockey is giving back; it’s one of the most special parts of the game. I’d tell them, “Love the game.” There is so much technical advice I could give and so much I could teach, but at the end of the day, you’ve got to love the game and love what you do to become successful at it. LS: I played lacrosse up until high school. Hockey got so competitive that I couldn’t really play anything else. I’m also an avid fly fisherman. LS: I’m pretty particular about my stick. I can tell when something’s off, whether it’s the wrong curve or it’s damaged. The NCAA is pretty good about getting us what we need. CR: What are essential items to take on a bus trip? LS: Definitely a pillow. We have trips that range up to 10 hours. Recovery clothes are huge. They’re almost like spandex pants and shirts that eliminate swelling. CR: When you’re back in Colorado, do you have a favorite meal or restaurant? LS: Big City Burrito. It’s a mom and pop shop. Their breakfast burritos are hands down the best I’ve ever had. LS: Definitely Joe Sakic, which is a pretty normal answer for kids my age from Colorado. 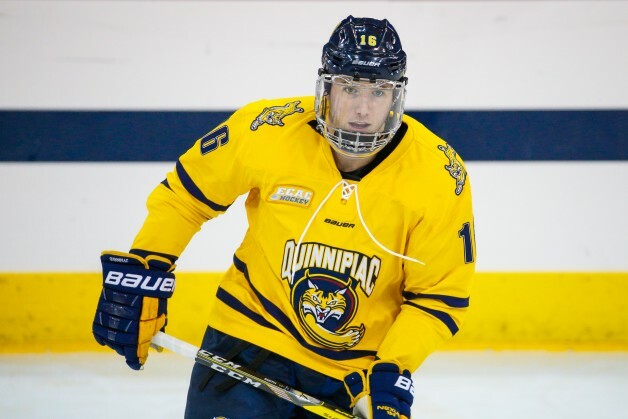 CR: What is the most challenging aspect of playing college hockey? LS: I think the hardest thing for me to get used to was the time management. You’re playing some of the best hockey in the world arguably. You have to balance that with school, family and social life. It just seems like you’re going, going, going.